Hello all! First of all I would just like to apologise for the slightly longer than expected delay in updating my blog. You may have seen my earlier post about the new build house we moved into last August? Anybody who has bought a house will understand the upheaval and its possible effect on day-to-day living. In our case, we’ve had builders in pretty much every day over the course of a year, yes really! 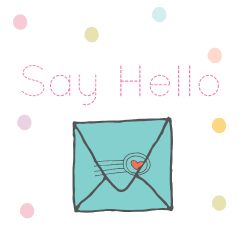 Well, that aside… whilst I’ve been trading during this time making beautiful party decorations and stationery for my Etsy and Notonthehighstreet shops, my blog has been somewhat neglected. This is now set to change as I am back in action, yay! So, I’ve made a few changes to my workspace over the past week. I ran out of space in my original room and we are lucky enough to have a few spare rooms. 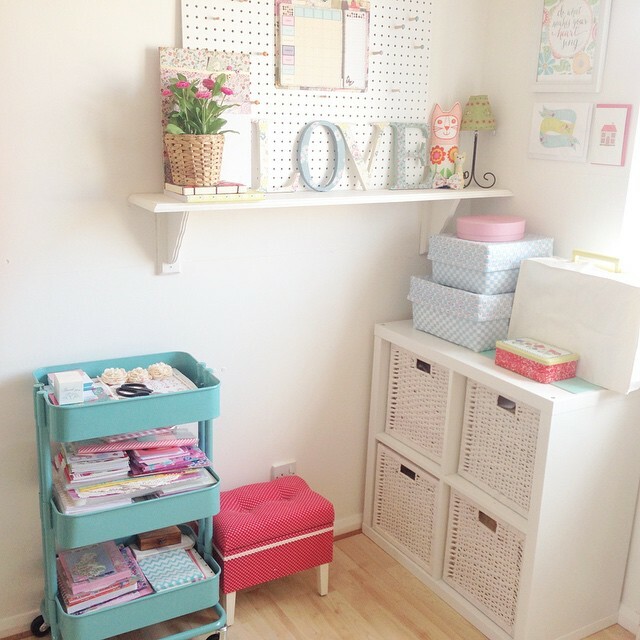 I thought this post would be the perfect opportunity to give you a little tour of my new craft room, how does that sound? You can see a close up here. I’ve used blu-tack to display my favourite prints. As it takes centre stage in my room, I wanted it to look vibrant and cheerful and I think it looks just that! No craft room is complete without a companion, right? For those of you who don’t know, this is our rather adorable Mabel. Mabel is our 1 year old miniature poodle and is wonderful company. She also has a nephew called Felix, who is our much loved 2 year old miniature poodle. Together they are double the trouble but we wouldn’t have it any other way. Here they are together, striking a pose! Luckily, the craft room is big enough to house two ikea desks. The one shown above is for crafting and drawing. I love my trusty desk storage as it keeps everything nice and tidy and very easy to reach. No drawing space would be complete without pretty decorations above it and some gorgeous eye candy in the form of a jug of flowers, would it? The desk to the left of this houses my iMac, printer, scanner, camera and all other technical equipment. Opposite my two work desks are a number of trusty ikea shelves which house all of my craft materials, tools and accessories, packaging, books and magazines etc. Even though this is a really functional space, it’s important to me that it remains beautiful, so I like to have lots of handmade touches scattered around that area to cheer me up. I love listening to the radio when I’m working. We live in such a peaceful area, it’s nice to have a bit of background noise to keep me inspired. The trolley shown above houses all of my glittered and patterned papers, stationery, scissors and all sorts of other handy bits. As you can probably tell, the shelves have pretty much reached full capacity now and there are still lots of things stored on the floor! Eventually, I’d like to have another form of storage in here, but it feels perfectly workable right now. 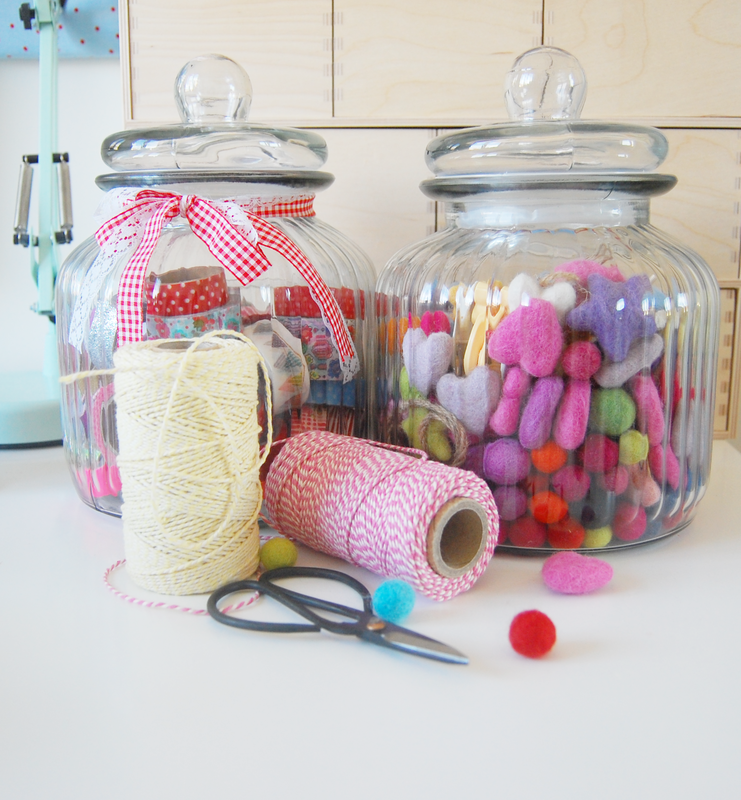 The large jars you may be able to spot are from our wedding a few years ago, they were used for tasty sweets and have now taken on the role of craft storage! Both of my desks face the window and it’s really nice having some green space to look at every now and then. It’s a nice little reminder that I live in Somerset and it’s one of the most beautiful places to live in the country. In the winter I like to light tealight candles whilst I’m working (and I have been known to get the fairy lights out too!) This just makes the room feel extra cosy and perfect for working in whilst sipping a lovely hot chocolate loaded with marshmallows of course! The memo board opposite my desk is super handy for staying organised. I usually stick floral post it notes to it. I added my own ribbon to it which seemed a bit more unique than the standard brown twine which it came with. 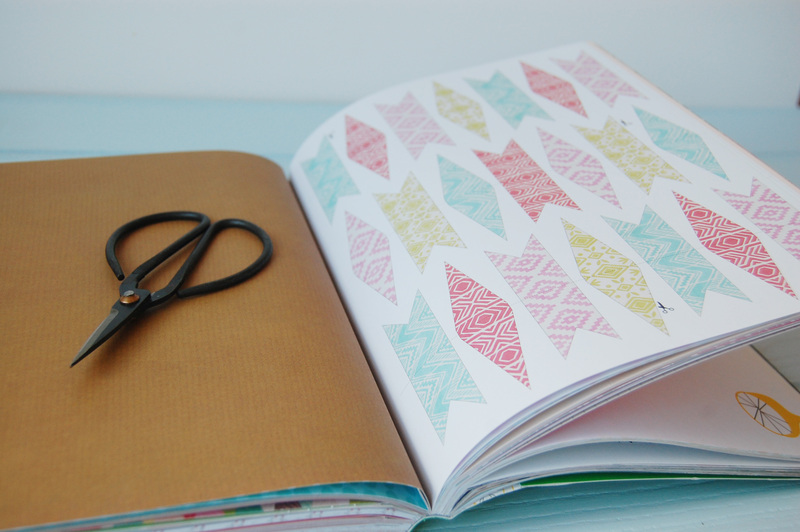 Not that I have anything against twine – I love it, as you can see from the other photos! We have the most comfiest crocheting spot upstairs, in what we call the ‘daybed room’ which is located opposite my craft space. Whenever we have visitors, this is where they stay. I have a fair few of my handmade cushions in here and it’s just a really lovely, peaceful space to have a break in during the day. Usually you’ll find Felix and Mabel snoozing in here during the day. Felix likes to throw all of the cushions all over the floor… just to make things extra comfy I imagine! (It’s a dog’s life) I have been told by a few people that this room has reached its maximum cushion capacity…. Is there even such a thing? That’s all from me for now, although I couldn’t help but share this photo of Mabel with you, doing what she does best…. posing! 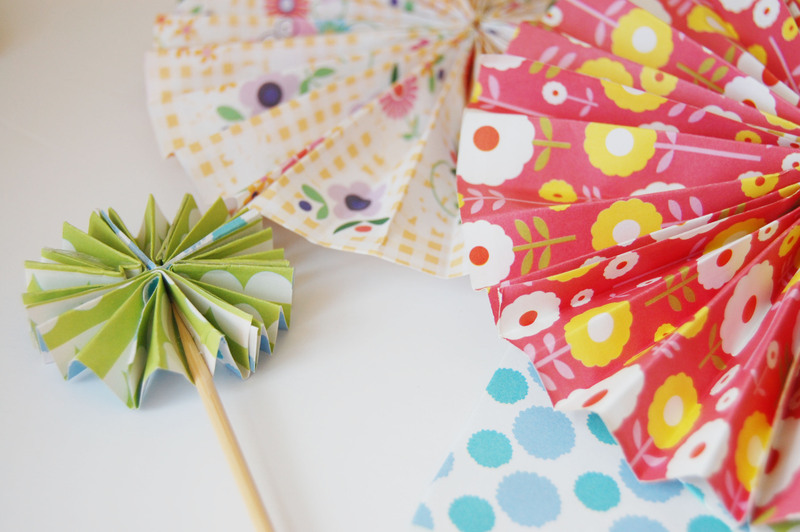 I hope you’ve enjoyed having a peek into where Paper Doily Party Shop is based. Happy crafting! Hello all! Before I start this off, I’d just like to say a HUGE thank you to you, my lovely followers for coming back for a read after a fairly long absence on my part. Paper Doily was put on hold over several weeks whilst my lovely husband and I (and our furry animals) moved into our new home. Now we are all settled in, I’m absolutely thrilled to be back in business alongside planning and writing lots of crafty blog posts for you! 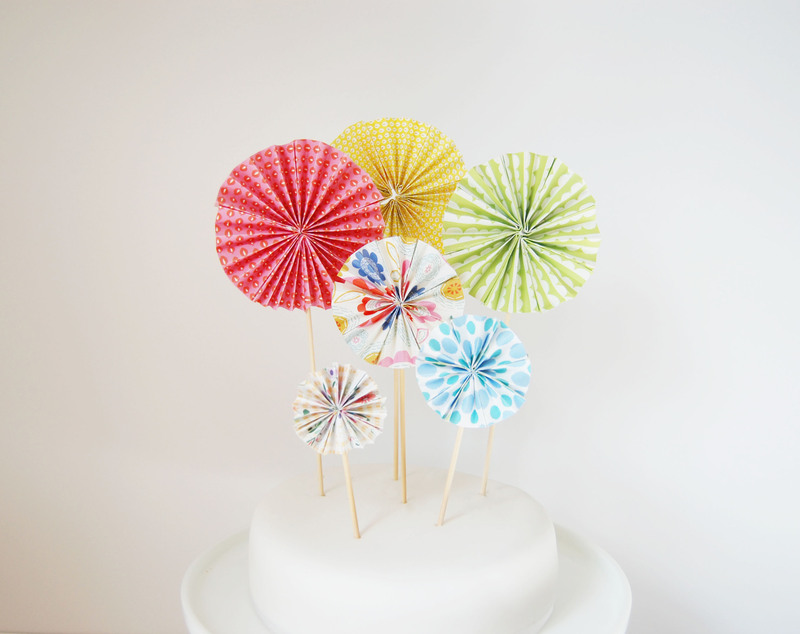 I’ve been meaning to work on this paper rosette cake topper tutorial for some time. 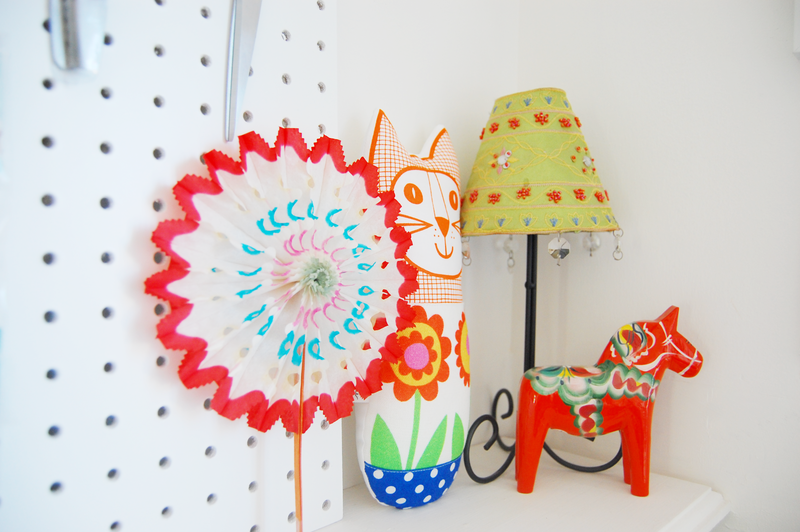 They were such an enjoyable make and they really cheered up my workspace. If you have a special celebration coming up which calls for a fun, vibrant cake decoration which requires minimal effort but happens to look fabulous, go and make a large mug of tea, find a comfy chair and read on. You’ll be pleasantly suprised how easy and effective these are. Take your chosen paper/s and divide it into 4 straight, equal strips. Once measured, use your scissors to cut them. There isn’t a set length or width to work by, this is entirely dependable on the size of the paper rosettes you are planning on making. Large/wide strips make for a large rosette and smaller strips make for a small rosette. You can experiment with this. 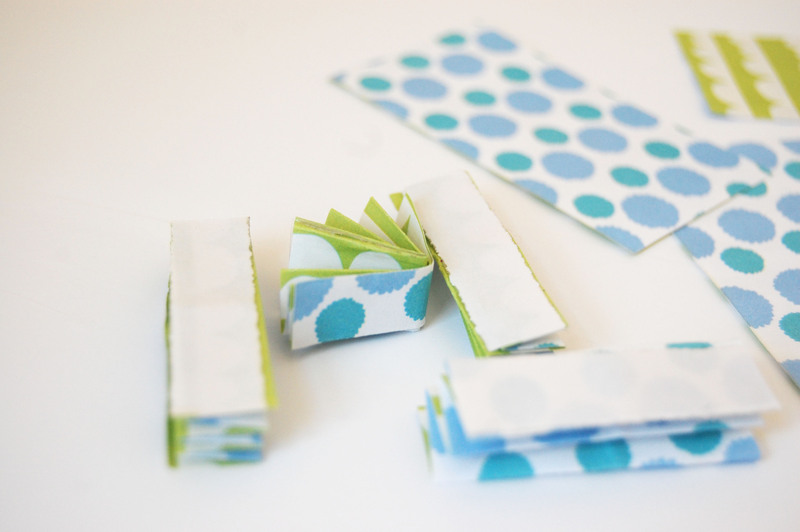 Fold the strips in half lengthways and cut them in the middle. You should then have 8 pieces of paper to hand. 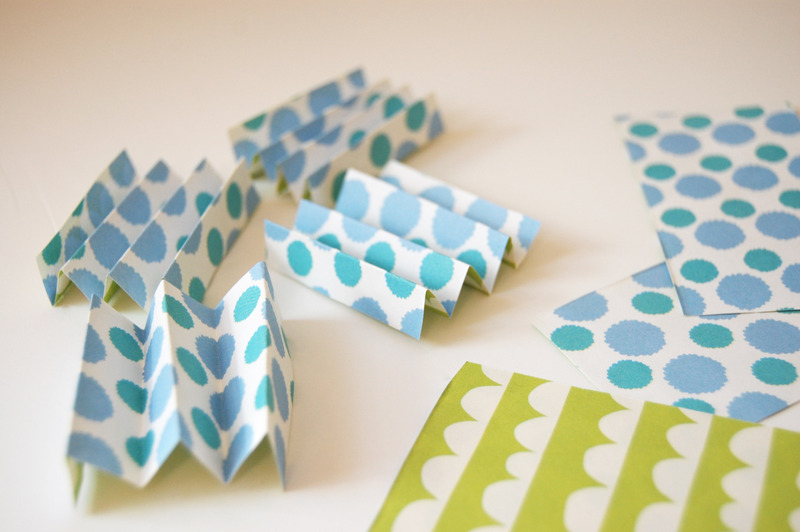 Next you’ll need to fold your shapes into concertina’s as shown above, trying to make the folds as even as possible. Take your double sided sticky tape and place a strip of it on one end. 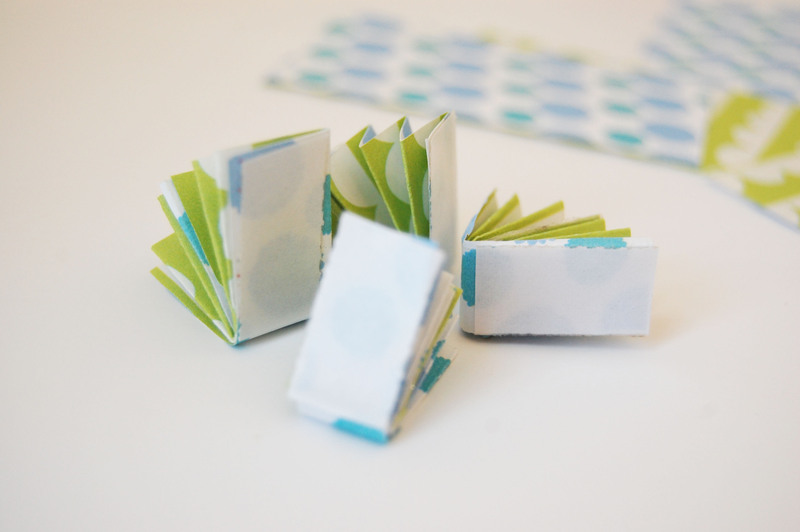 You will then need to fold each of the concertina’s in half, pressing the double sided sticky tape together as you go. Your concertina’s should be looking like this and you should finish with eight. (This was a work in progress shot). Once finished, place a strip of double sided sticky tape on each end of your concertina’s. Once you’ve peeled the backing off of the tape, you’ll be able to place each concertina together, attaching them all together in a circle. 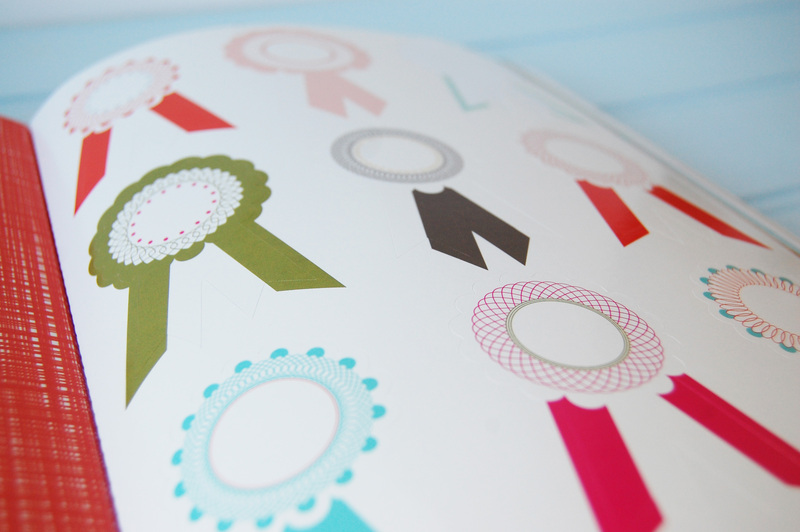 Once finished, you should have a beautiful paper rosette looking similar to this one below. At this point, you can leave the paper rosettes as they are and simply use them as decorations, either on a wreath or as a garland, or to embellish party bags or special gifts. They also make wonderful table decorations. The possibilities really are endless with these beauties! If you’re making these to decorate a special cake or set of cupcakes, you’ll need to take your bamboo skewers and glue at this point. If you’d like to vary the height of the rosette cake/cupcake toppers, take a sharp pair of scissors and trim the bamboo skewers down to your desired length at this point. If you’re planning on decorating a cake with them, I think they look very effective when they are cut to varying lengths as it allows each one of them to stand out. Turn the paper rosette over to the reverse side and place some glue in one of the concertina folds. Take your bamboo skewer and place it over the glue. Leave to dry completely. Voila! Feeling impressed and inspired? I very much hope so. I’d love to see your finished results if you decide to make them! If you’re feeling in the mood for more craft tutorials, you can check out my full collection here. Enjoy! 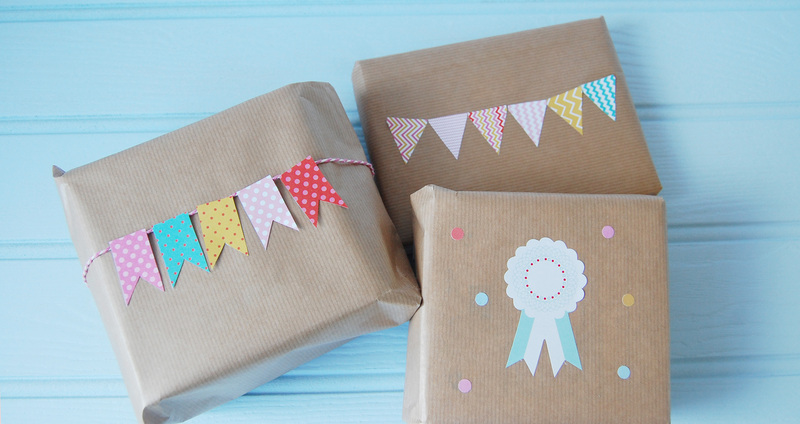 Having seen so many inspiring photographs through my hours on end of Pinterest browsing, I have been itching to experiment with gift wrapping ideas. Admittedly I cannot take all of the credit for this tutorial. 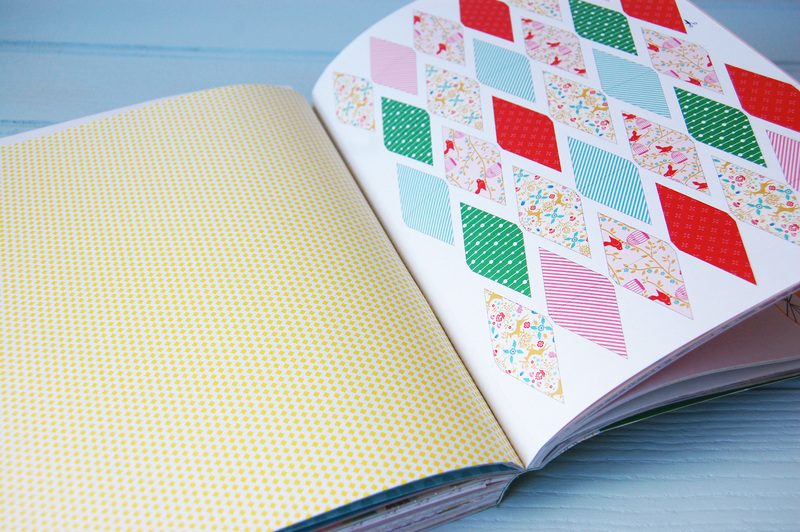 I purchased the Flow Book for Paper Lovers several months ago now, and have been looking for the perfect projects to use the incredible papers for, for a long time! 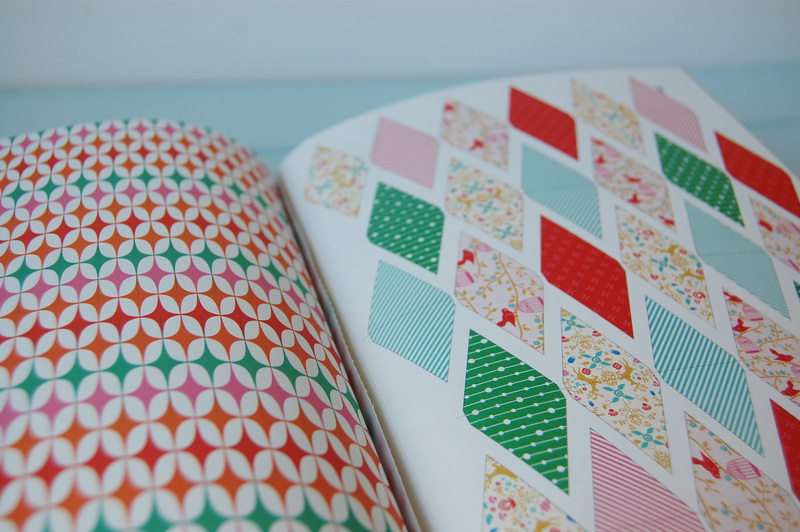 The papers are designed by a number of incredibly talented designers and offer SO much print and pattern inspiration. I’d highly recommend it for personal craft projects. Brown Paper, Patterned Paper, Bakers Twine, Glue Stick/PVA, Pencil, Ruler, Scissors, Clear Selotape, Eraser, Hole punch/ small circle paper cutter. As you’ll see from the photographs above, the incredible Flow Magazine included a set of beautiful templates for use as paper bunting. This made my life a whole lot easier. However, it isn’t essential to use the templates above, as you can follow my guidance below. 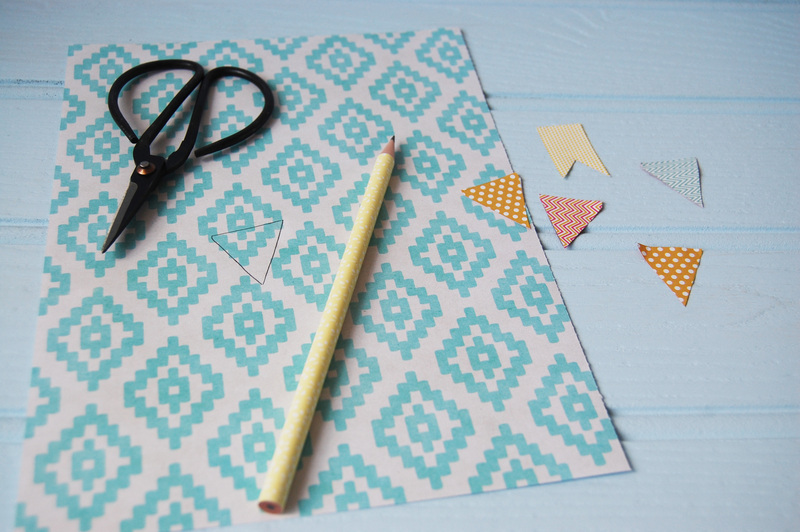 If you don’t have access to the magazine templates, simply take a pencil and ruler and draw a simple flag and triangular bunting outline on your chosen papers. 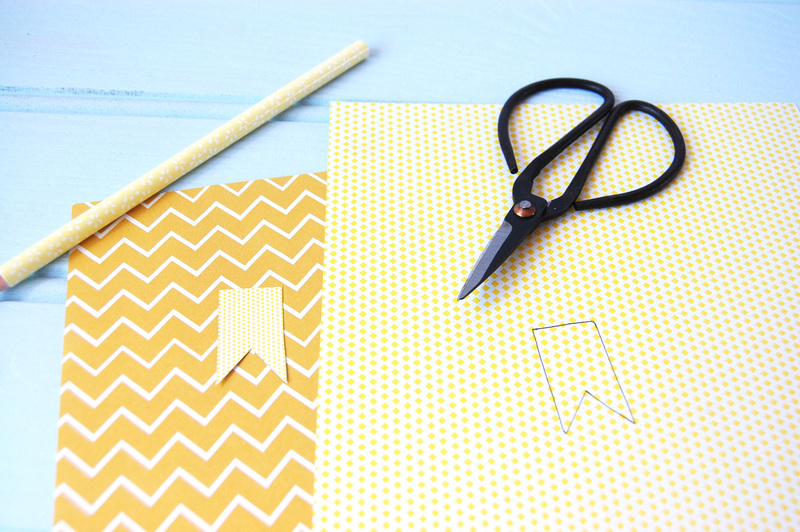 This will make your template, which can be used for cutting out all of your other bunting and flags. 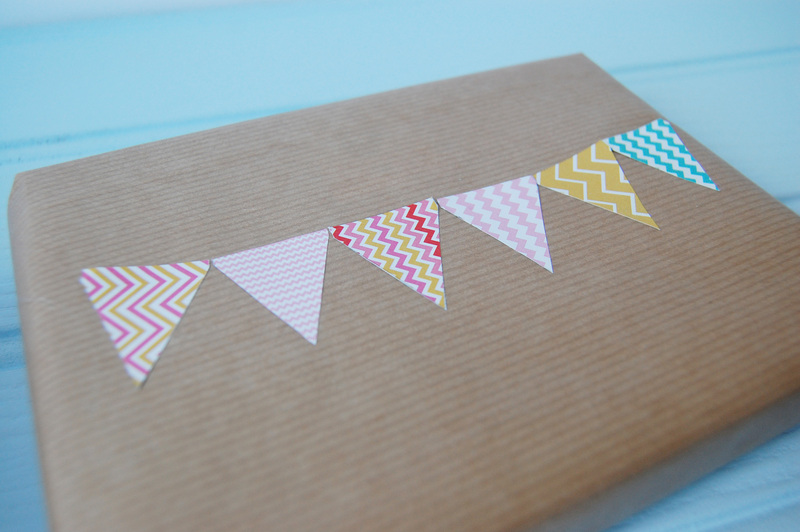 Be sure to erase any pencil marks and also measure the width of your gift, to establish how many flags are needed. Take your gift/s and measure the brown wrapping paper. Once you’ve wrapped the gifts, take a glue stick. Simply glue the bunting in a long line as shown below. If you’re wrapping more, then that’s your first present done. Doesn’t it look adorable?! For the next gift, you’ll need your bakers twine. Cut out enough twine to wrap horizontally around the whole gift. You can secure the twine on the back of the gift, by joining both ends of twine together with clear selotape. Once you’ve done that, turn the gift over so it is front facing. Take your PVA glue and dip the top of each flag into it. Place each flag one by one, on top of the twine until you have something like this below. If you’re wrapping a third present, then complimenting stickers are a perfect option at this point, along with some mini paper circles. Perhaps something like this below? 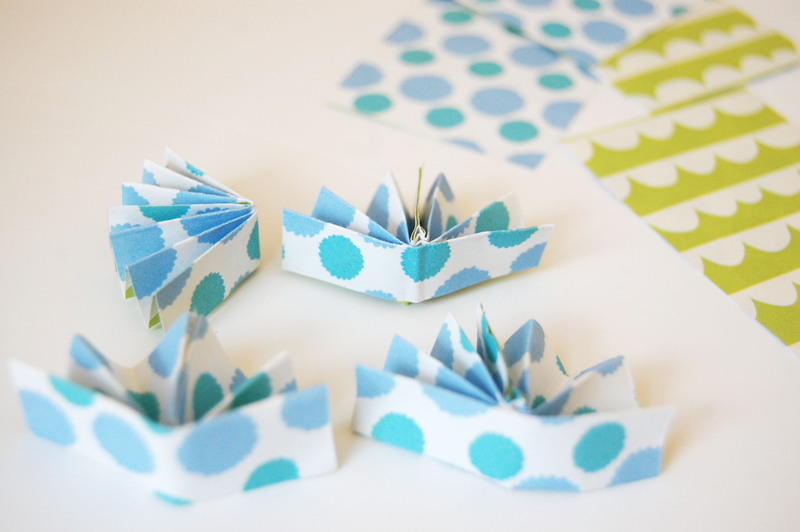 For the tiny circles, I used a mini circular paper cutter, which is available in most craft stores. I chose some plain, complimenting shades of paper for those bits. Feeling inspired? 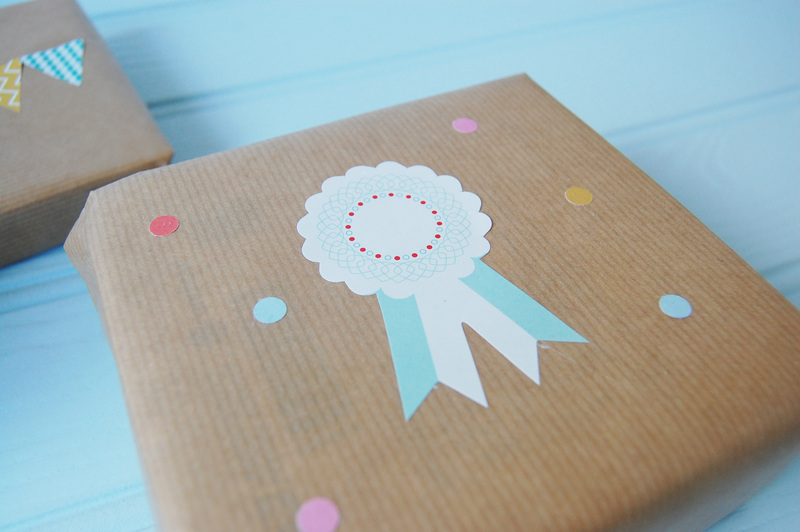 Gift wrapping is definitely all about having fun and showing your friends and family how much you love them. This seems like an absolutely lovely way to put a smile on their face too. If you happen to use my tutorial then do let me know, I’d love to hear from you. 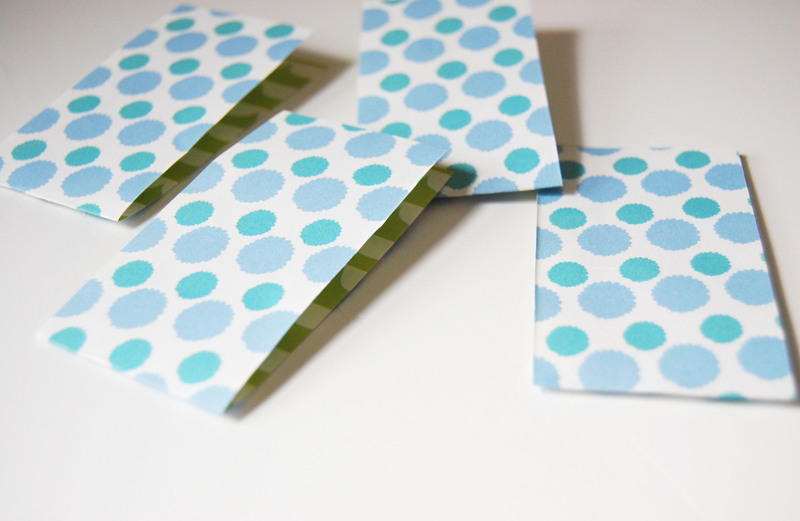 If you enjoyed this tutorial, then you may also like my DIY Envelope Liners Tutorial for complimentary envelopes? I also have a yummy, scrumptious Vanilla Cupcake Recipe which may be right up your street. Enjoy and thank you so much for reading. See you soon! 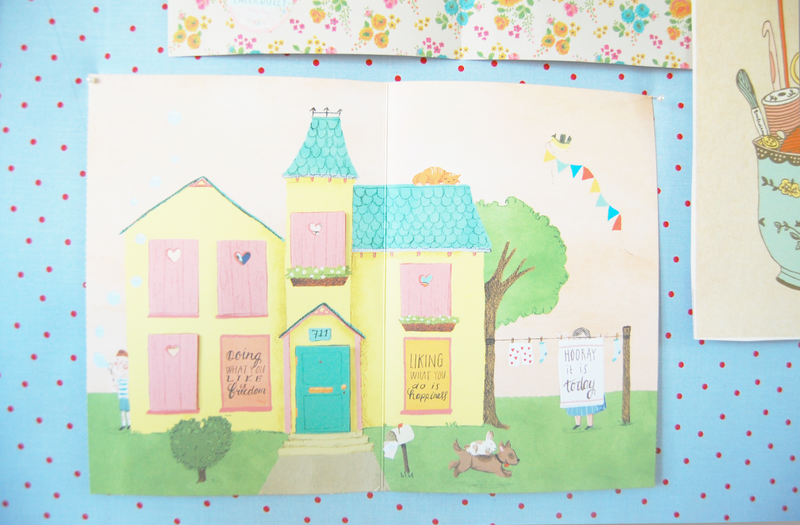 I thought it would be really lovely to show you where all of the work happens for Paper Doily Party Shop. 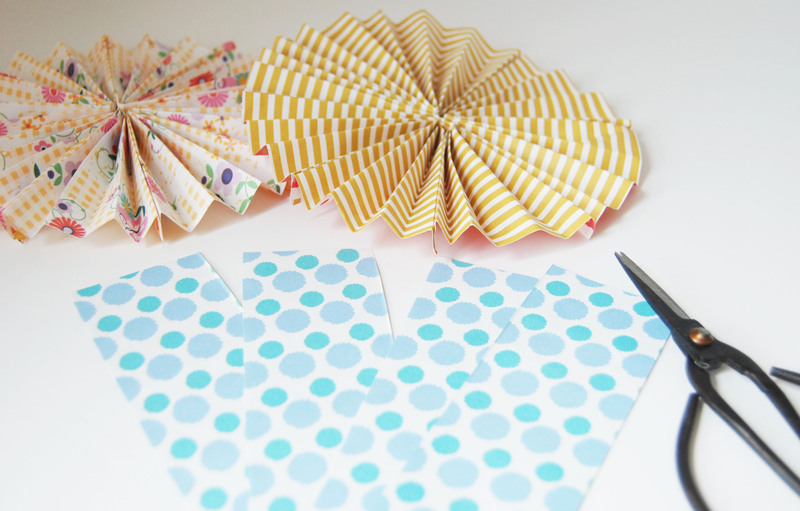 If you’ve happened to read my about section, you’ll know that Paper Doily Party Shop was born from my love and excitement for handmade party products and is my full time job. I’m very lucky to have a workroom to myself, completely dedicated to the business. I’ve tried to make it as inspiring as possible. I will admit that at times it’s a job in itself keeping it tidy, so I’ve tried to utilise the space to the best of my ability, by placing a lot of my items in pretty storage jars, useful shelves, storage trolleys and baskets. 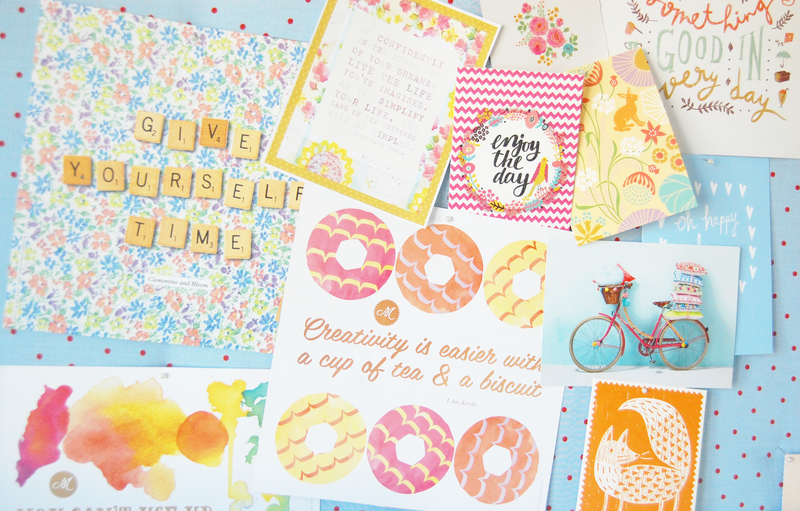 I hope you enjoy having a peek into this special little workroom of mine! First of all, welcome to my inspiration board. I completed a Textile Design degree at Chelsea College of Art and Design several years ago, and absolutely loved having my own little inspiration board above my desk. This is something I’ve always continued to have since graduating, and something which I absolutely love adding to. Whenever I see a beautiful card, print, quote or anything else worth pinning up, (mostly from the rather amazing Flow Magazine) I grab one of my pretty pins and find a perfect spot for it. This was made from a large cork board from a stationery shop. I covered it in foam and fabric to make it prettier, and will eventually add ribbon to it to protect the fabric and change the look. 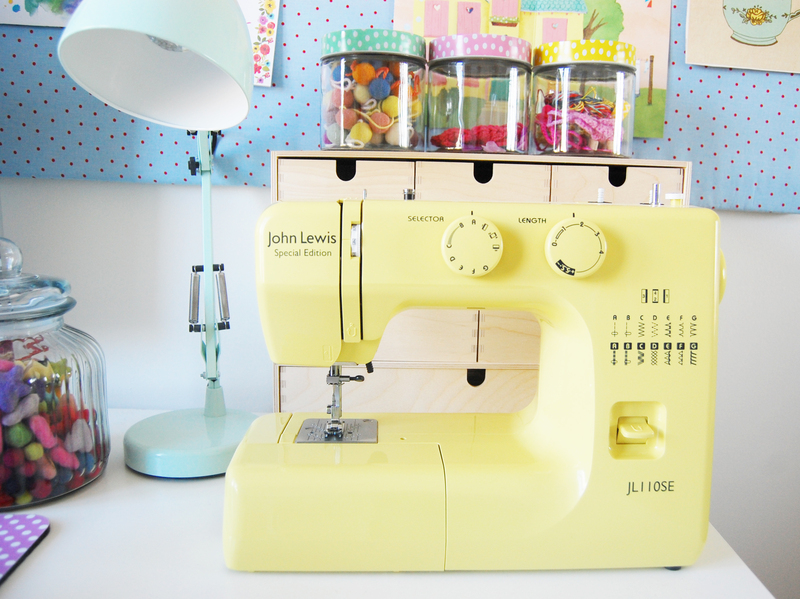 I recently purchased this beautifully vibrant sewing machine to expand my party decoration range. I’ve used it several times already and I absolutely love it! 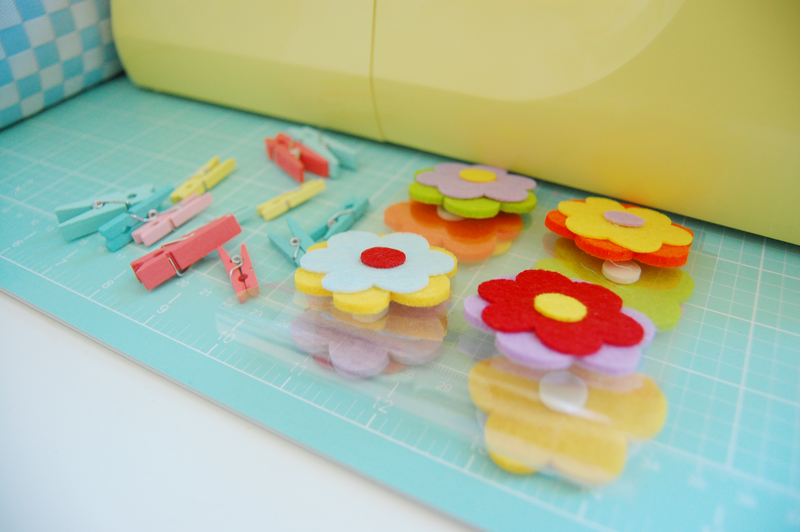 Not only is it perfect for small sewing projects, it adds a much needed splash of colour to the entire room and never fails to put a smile on my face! Here is a close up of some of my trusty storage jars. 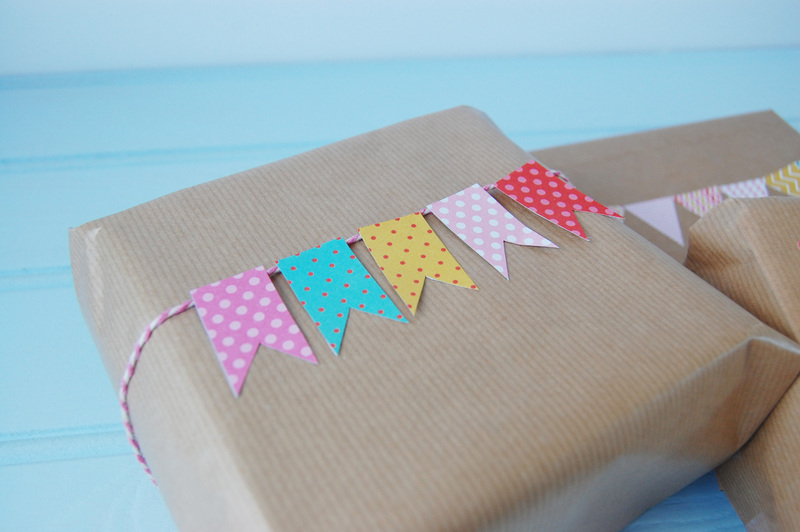 The spotty colourful ones are from Tiger and are super handy for storing crochet bits, garlands, paper decorations etc. If you’re anything like me, you’ll have several unfinished craft projects on the go. These jars are great for storing these kind of projects, as unlike being stored away in a draw, they will be fully visible to your eye, longing to be finished! I’ve contemplated moving them to the kitchen, but they look far too good alongside my sewing machine to remove from my workroom. The rather large sweet jars pictured directly above, were actually purchased for our wedding dessert table last year. 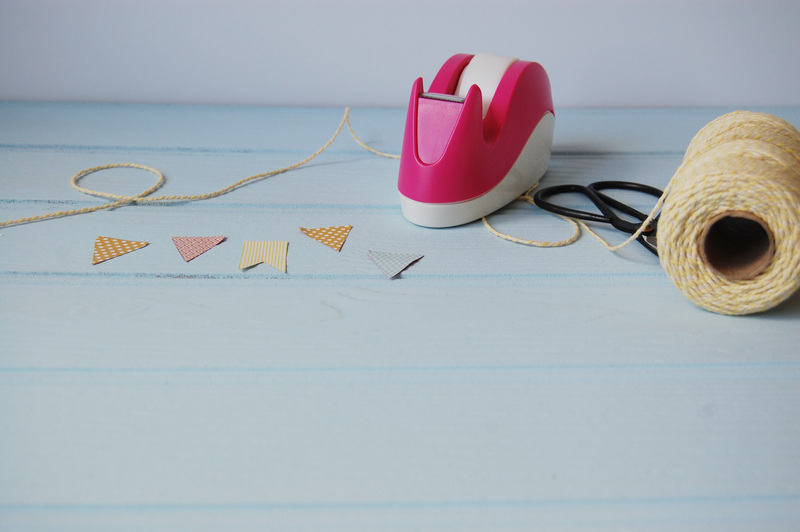 If you’ve browsed my etsy shop you’ll know how much I love wool felt, washi tape and twine. 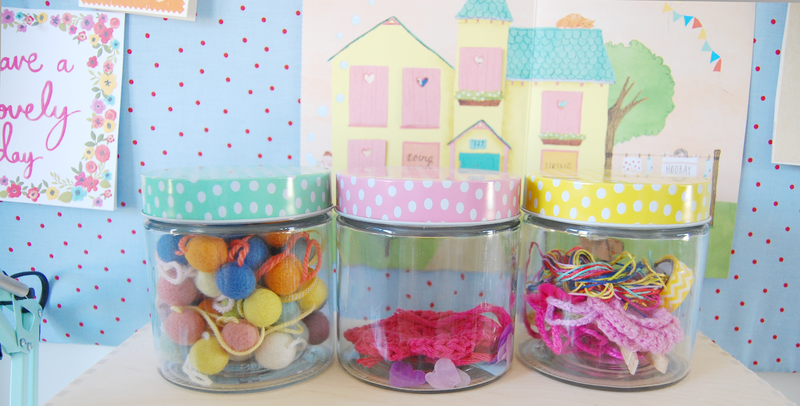 These jars are the perfect storage solution for all of these little bits! All workrooms need cute little ornaments, candles and paper decorations right? Mine certainly does and I love glancing over at them whilst working. 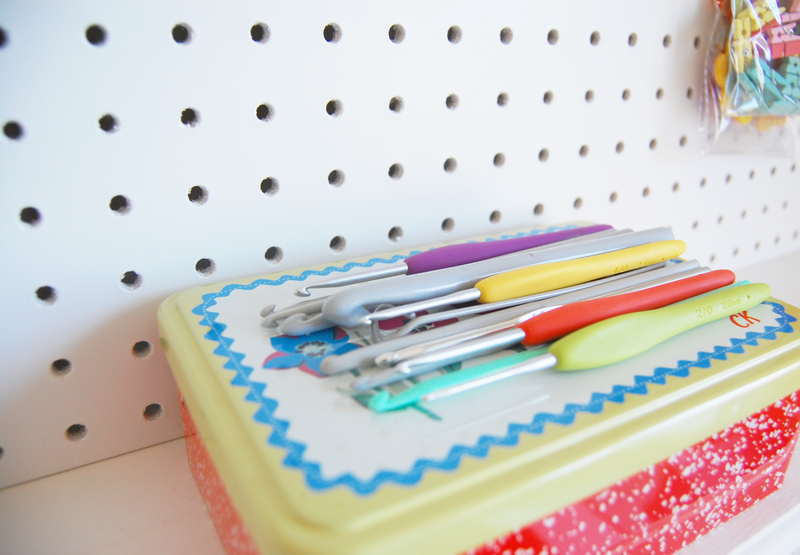 The peg board pictured behind them, is also super useful for storing general craft tools, particularly pastel coloured craft materials (obviously!) For any of you who aren’t aware, I run a local crochet group in Bath, UK, so I like to have somewhere pretty to store my crochet hooks. 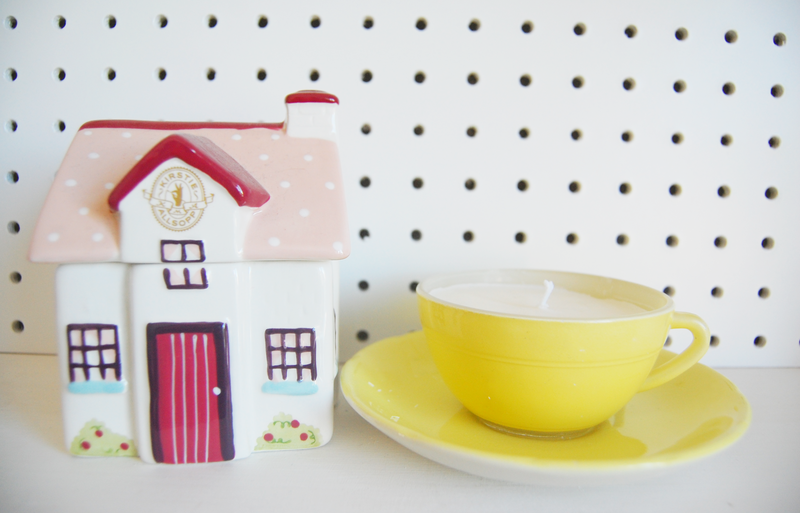 This Cath Kidston tin is the perfect solution! Notice a yellow theme? I really enjoy having plants and flowers in my workroom. I do have to try my hardest to water them, (and sometimes fail miserably) but feel it’s definitely worth it when they are this vibrant. 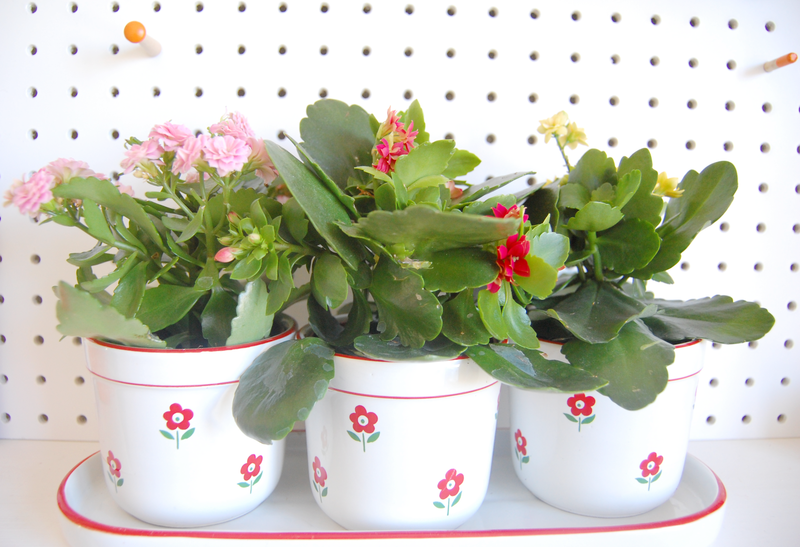 The beautiful plant pots and tray are from the extremely friendly Sue from Yay Retro, one of my favourite vintage shops. Here is my favourite corner of the room. I adore my ikea trolley. After several months of deciding whether to take the plunge and buy one, I’m very glad I did. It’s very handy for storing my wedding stationery range, cards, wrapping paper, pretty bags and anything else handy. The other white storage unit is currently filled with yarn for a blanket I’m making. One day I hope to finish it, but right now I’m lost in a never ending sea of crochet squares! Anyway, I hope you’ve enjoyed my workroom tour. 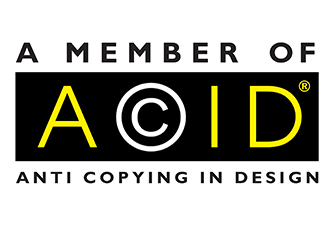 I would love to know if I’ve inspired you, so do come and say hello if I have!